Does rainy days make you feel under the blue and make you grab that favourite sweatshirt of yours? It will be interesting to note the seasonal influence on our everyday style. When it is rainy and windy, we tend to choose more comfortable clothing to withstand these conditions since it is not so much fun getting light coloured pants stained with muddy water or jumping into puddles with high heeled stilettos or wearing a loose flowing dress on a windy day. So, seasonal variations dictates people what to wear coupled with fashion trends depending on each country or region. Imagine how hard it might be to walk under the sun in thick boots or dressed in a fur jacket, even though, these two are considered fashionable. Thus, people who live in hot tropical climate prefer wearing free, light clothing to beat the heat. Each season therefore opens a new way to experiment with style. Those items that have been sitting deep in our drawers can perhaps be put to use the next season. Actually it is a good rule not to throw away stuff, because fashion is repeatable. This means that an item that is out of favour today, might actually make an appearance a few years down the line and be in vogue, literally! The market is flooded with ample of options that you could wear on a rainy day when you detest wearing your favourite pair of sneakers or pointed heels? Instead, you can go for rubber boots adorned with flowers, laces, bows or just plain transparent ones. This way you won’t have to compromise on your style. If you do not want to give up heels, the fashion market is filled with high heels gum boots. Let’s talk of raincoats! Raincoats do not have to be boring any more. Have you seen the variety of raincoats available in the market today? A few years ago it was hard to imagine raincoats in anything but cellophane material. 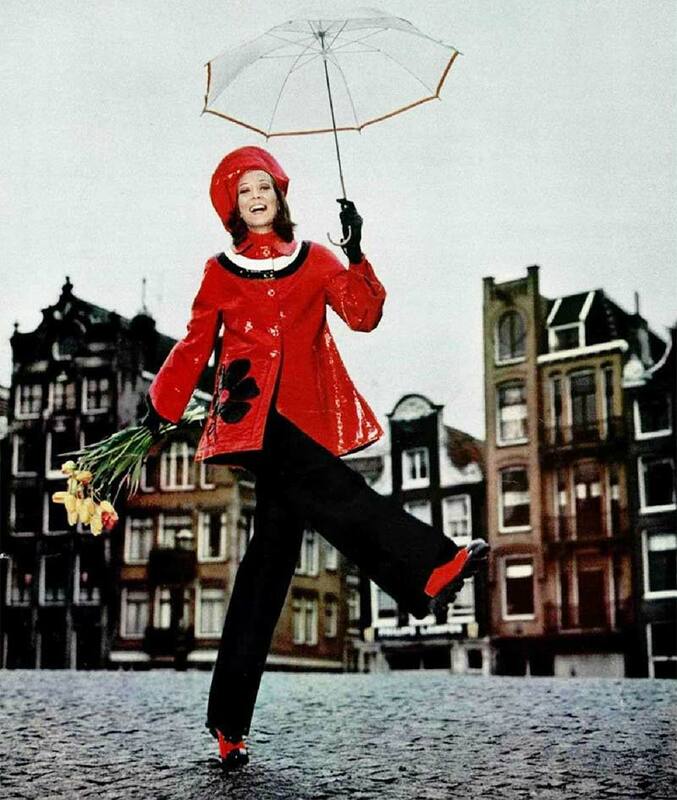 But in today’s fashion environment, raincoats come in all sorts of its colors and shapes. The latest trend is the poncho coat style which is comfortable to wear both with dresses as well as pants. Jackets are the epitome of style, be it in any season. They are timeless and can be made both from light fabrics as well as thick materials. Paired with fur collars to satin skirts, Parisians are renowned for pulling off the jacket look with such oomph and class in every season. People from the Southern regions such as Latin America prefer wearing bright clothing reminiscent of a festival of brilliant colours. Inspired by gorgeous sunny weather, their style carries ethnic bright motives, bold carnival-like colours, brave animal prints and peculiar accessories. They love to flaunt their extravagant heavy necklaces, earrings and other accessories. Turbans, head wraps and head bands are hot choices and are just perfect for those windy summer days. There are plenty of ways to wear them and rock the boho chic or eclectic look. So, what is the weather outside? Would you like to curl up in some comfy woolens or prefer to brighten things up with a floral dress?